This research looks at the effects of electric fields on the growth of mung seeds grown in containers in water, and grown hydroponically in plugs made of bark material. The purpose of these experiments is to examine the sensitivity of the plants to their environment, specifically to an imposed electrical force. The seeds are grown in two separate groups: a control group and an electric field group that is under an electric field. The electric field is created by applying a 5000 Volt DC to a metal grid that is immediately above where the seeds are growing into plants. At the end of the experiment the length of roots and stems are measured to look for differences between the two groups. Mung seeds growing hydroponically in the faraday cage under the influence of the electric field. At the beginning of these experiments, the seeds are weighed then placed on grow paper in containers to sprout. They are kept watered as they grow. The control and e-field groups are both grown in the same way, inside a faraday cage, except that the electric field is not applied to the control group. At the end of the experiment, the plants in each container are weighed, the plant material is dried, and analyzed for nutrient content. 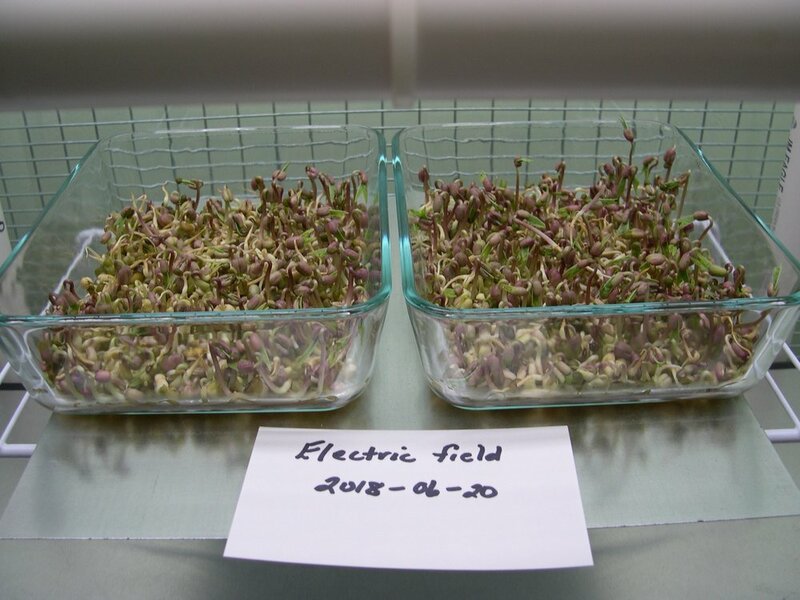 Other plant experiments include growing mung seeds under the influence of different electric fields, to determine if there is any change in the growth of the plants, when the electric field is lower or higher. For the hydroponic experiments, the mung seeds are placed in bark starter plugs to grow in tubs filled with water. The roots of the plants grow down into the water. Hydroponic plant nutrients are put into the water during the growth cycle. The control and e-field groups are both grown the same way inside a faraday cage, except that the electric field is not applied to the control group. At the end of the experiments, the roots and stems are measured and the control and e-field group plants are compared. The plants are dried and the plant material is analyzed for nutrient content. This research investigates the effects of positive, negative and neutral thoughts on plant growth. The purpose of this experiment is to learn how to send specific energy and thoughts to plants, and to see if there would be a noticeable result to the growth of the plants. We welcome you to replicate this experiment and share the results in open collaboration. These papers explain results from the plant experiments. You may join this work at any time and record your observations. A sample form is available for your use. Contact us for more information. This research investigates a person’s awareness of forces and energy in themselves and the world around them. In this study, individuals use their physical and inner senses to observe and record the effects. Goldsworthy, A. (2006). "Effects of electrical and electromagnetic fields on plants and related topics" in Volkov, A. G. (ed.) Plant Electrophysiology—Theory & Methods. (2006) pp. 247-267. Heidelberg, Berlin: Springer-Verlag. Kaufman, P., Ruiz-Columbie, A. Artificial Atmospheric Ionization (pdf). Klatgamjorn, P., Khan-ngern, W. Nitta, S. The Effect of Electric Field on Bean Sprout Growing (pdf).